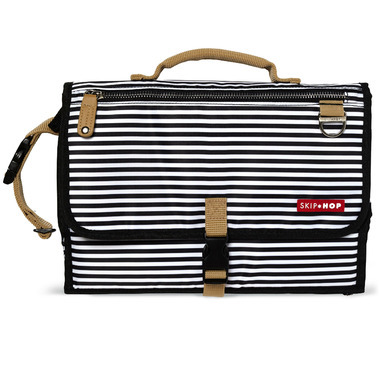 Skip Hop Pronto Signature Changing Station is the ultimate diaper changing tool and makes baby changing easy—no matter where you are. An ultra-convenient clutch features a wipe-clean, zip-off changing pad, built-in pillow and translucent wipes case for timely refills. 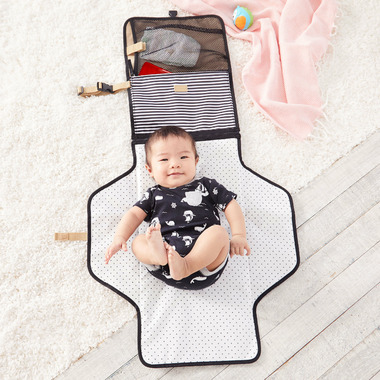 The large mesh pocket holds up to four diapers plus creams and other essentials, while the front zippered pocket is perfect for keys, cell phone or other personal items. Simply drop the Pronto in your bag, strap it to your wrist or clip it to your stroller and go!